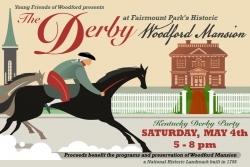 Get out your fancy hats and trot over to our Kentucky Derby party supporting the programs and preservation of Woodford Mansion! Enjoy craft cocktails made by the folks at Manatawny Still Works, craft beer from aptly named Workhorse Brewing Co., and mint iced tea, along with savory southern style cuisine. Pre-race TV coverage all afternoon to see who takes the crown. Race starts around 6:30 pm. Guests are encouraged to wear festive Derby attire!